The most innovative companies from the conference this year include a new standout for P2P fundraising aimed at young donors on their native streaming platforms like Twitch and YouTube, and a new all-in-one information and engagement platform for public policy and grassroots activism (below). The new report from COHORT3 highlights the Top 5 most innovative technology products for fundraisers chosen from 125 exhibitors at the 2018 NTEN Conference. 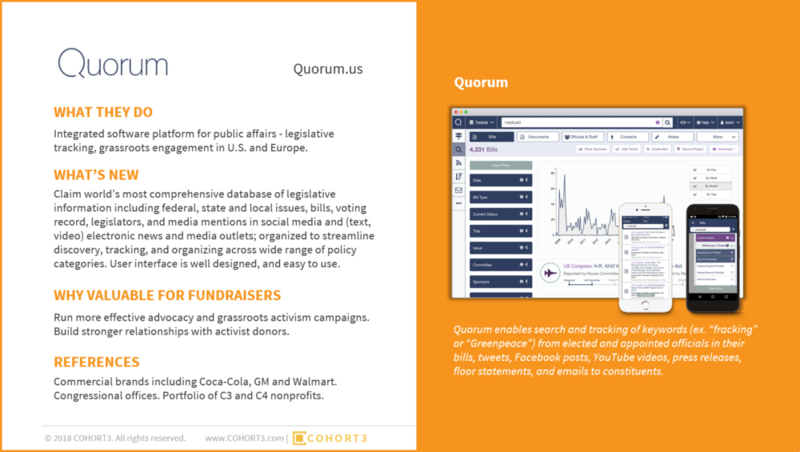 Download the report to learn more about Quorum (above) and the other innovators. Receive a free copy of the report today. Thanks for your interest in the 2018 NTEN CONFERENCE - Top 5 Most Innovative Technology Products. COHORT3 analysts help fundraisers and their technology peers to accelerate the pace of innovation and revenue growth. JEFF PATRICK is the CEO and Founder at COHORT3. Jeff brings 20+ years experience driving individual giving programs at some of the largest nonprofits in the industry. He is a recognized industry expert, speaker, writer and thought leader on modern direct marketing fundraising, and the author of the Top 5 Innovator Report.